What is negative space? Basically, negative space is the area around an object (or designated positive space). This is a common phrase used when describing photography composition, but it applies to most artistic expression, including accessories, jewelry-making and we've even seen negative space manicures. See how being conscious of negative space can impact your jewelry design decisions and spark a few new ideas. 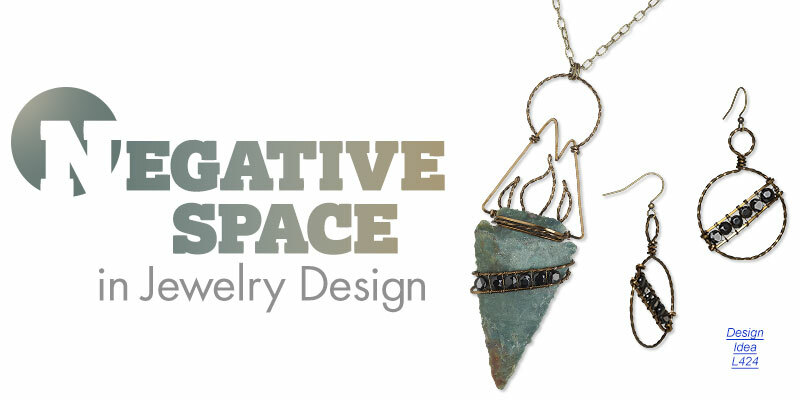 Why is Negative Space Worth Considering When Designing Jewelry? It boils down to the way we look at things. Negative space is important because our brains tend to not like looking at too-busy or over-crowded images--we don't know what to focus on as we break down what we're seeing into more manageable portions. Giving your intended focal point(s) some negative space, or breathing room, creates clean distinction and definition of the design itself. Another fun advantage of negative space is creating images within images or "seeing what isn't there." People love discovering an illusion and feel "included" in the concept. Think of some well-known logos. The NBC peacock is formed by the white space placed between colorful teardrops. FedEx has an arrow in "Ex" created by the font choice--even in Japan they made sure an arrow was still present in the negative space between characters. The No Kid Hungry® logo used the concept of the Rubin vase to create a picture within a picture so it looks like an apple or two children's profiles facing each other. However negative space is implemented, the result is memorable. 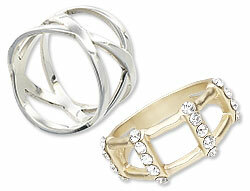 Geometric shapes are popular in jewelry--and always seem to be. Use negative space by creating open, simple geometric shapes. The clean lines outline a well-defined shape so you, and your customers, can appreciate what is--and isn't--there. This type of negative space is often used in minimalist designs such as simple wire forms or stacked wire rings on different points of the finger to create even more negative space intrigue. Modern architects and abstract artists love using negative space to create depth. Make modern-looking jewelry that takes on silhouettes of structures like cuff bracelets and rings. Explore inspiration from suspension bridges with thin styles of chain connected to varying points on focal components. Riff on the idea of depth by using layers. Capitalize on contemporary asymmetrical earring trends by making one earring a solid shape and the other an outline of the same or part of the original shape. We've talked about shape outlines, but framing is a little different. Framing is more about using a shape to simplify and direct focus to a point of interest. This can be done with an open area (cutout), bead frames, contrasting color or use of a “non-color” (white and black). You’re able to isolate and define while potentially introducing drama. This is found less in jewelry and more in logo design, as discussed earlier, but that doesn't mean you can't. In fact, you're likely to stand out if you do. 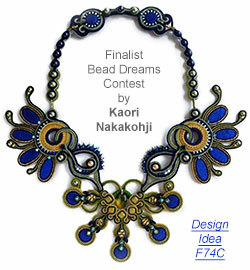 We'll just leave Kaori Nakakohji's Bead Dreams finalist piece Peacock here and let you find what images YOU see within. Imply a shape with other shapes, create silhouettes, use unique cutouts, make an open ring or cuff bracelet where the two ends create an image in the negative space. It's all about absence actually being presence. Let's review. What does negative space do? 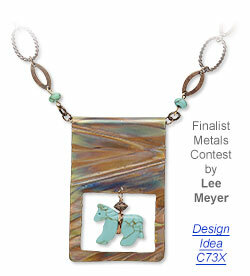 It gives you new horizons to explore when making jewelry! Play around with negative space in necklaces, bracelets, earrings and more to turn a negative into positive attention.